When I speak to groups about why government agencies and jurisdictions should measure and improve employee engagement, I always hit at the “why it matters” question very hard. That is, why should government focus on measuring and improving engagement? My answer is that improving engagement is about improving the performance of government. Engagement is not just another touchy feely HR project the rest of the organization can hunker down and ignore until it goes away. Nor is engagement is about trying to make sure that our employees are happy all the time (although, given the alternative, we want our employees to be happy — most of the time, anyway). The real answer is that improving engagement is about improving government performance and service delivery. Decades of research, including in government, have shown that boosting engagement links to outcomes that matter, such as strategic goal achievement, customer service, innovation, employee retention and even attendance. 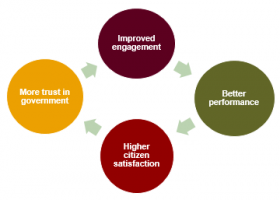 But there is also a larger context for improving engagement — boosting citizen satisfaction with, and confidence in, government. In my organization, we refer to this link as the “engagement value chain,” as show below. When government employees believe the citizens they serve trust government, these public servants are likely to have a higher level of engagement. In other words, a virtuous cycle. And don’t we need to increase citizen satisfaction and trust in government? When I make the argument that engagement drives performance, I often cite research conducted a few years ago by the Gallup organization and the Partnership for Public Service). Everyone knows who Gallup is. The Partnership is a nonpartisan nonprofit dedicated to helping government (primarily the federal government, the nation’s largest and most diversified employer) attract and retain talent. The Partnership’s work includes research to create knowledge on how to attract and retain talent in government. In the interest of full disclosure, I need to point out one of my (many) previous jobs was VP for Research at the Partnership. During my time there, we collaborated with Gallup on a telephone survey. The survey was designed to assess the public’s attitudes toward government. While the focus of the survey was on the federal government, I think the results apply across the public sector. The survey questions Gallup asked included probing each respondent’s recent interaction with a government employees. Gallup asked the folks who responded to think about their most recent interaction with a federal employee—and then ask them to rate the quality of that interaction. The responses to this question were very revealing. Gallup found that when people said they were satisfied with this single interaction with a public servant, they were also three times more likely to rate government in general positively. This proved to be true even if the survey participants hadn’t received the answer they wanted. This is a powerful finding. It’s powerful because it suggests individual public servants can move the needle of public opinion about government overall — one interaction at a time. This is a very empowering result for all government employees. Of course, to boost public opinion about government, public servants need to deliver responsive service. To do this, they must be committed to their organizations, believe in what they do and be dedicated to providing good customer service. In other words, they need to be engaged. Engaged employees have pride in their organization and its mission and are deeply committed to its success. They find their work meaningful and rewarding. As a result, engaged employees deliver results – for the organization, its leaders, coworkers and the public. And that’s why government should measure and then act to build employee engagement. Improving engagement isn’t just a fad or another HR program. The research has been done and the results are clear. Measuring and then improving engagement is about performance and delivering results to the American public – one interaction at a time. That’s true across the nation, in the states and in our local communities.